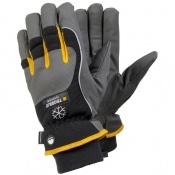 When working in cold conditions, you'll need gloves with a suitable lining to keep your hands warm and safe from the debilitating effects of frostbite. The Ejendals Tegera 9113 Thermal Waterproof Work Gloves are medium work gloves made with durable Microthan+ fibre that provides excellent levels of grip. 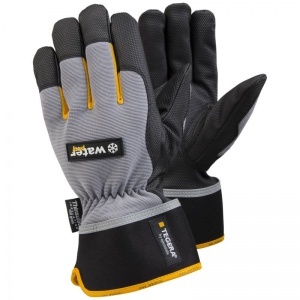 Featuring a winter lining of Thinsulate 100g and fleece as well as a wind/waterproof exterior, the Ejendals Tegera 9113 remain warm and comfortable in wintry conditions and are suitable for a huge variety of medium duty tasks. The Ejendals Tegera 9113 Gloves are supplied in a grey/black/yellow design with a diamond grip pattern for further improvements in grip. 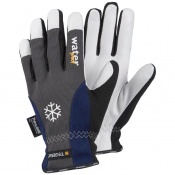 They feature an elasticated 360° fastening at the wrist for a comfortable fit. The product code for these gloves is 9113. The table below showcases the test results of the Tegera 9113 Gloves according to EN388 Mechanical Risk specifications. The Ejendals Tegera 9113 are offered in six different sizes, the dimensions of which can be found below. To measure your hand, measure the circumference of your hand around the knuckles (excluding the thumb) with your hand open and your fingers together. I work in a stable yard out in all weathers and nothing is worse when mucking out stables and taking care of horses than cold wet gloves. I bought these new Tegera gloves and I couldn't be happier. Arrived just before the snow too! Good fit, warm dry hands makes a world of difference. My wife says 5 stars too as I'm in a much better mood when I finally get home!!! I was very hopeful that these gloves would do as I hoped, working with water everyday, Dry, warm hands are essential. These gloves surpassed my hope, doing exactly as described. 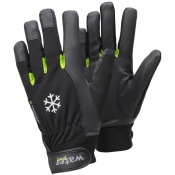 They are undoubtedly the best work gloves I have bought to date. I would highly recommend.